BRACELET - SARAH COVENTRY. "LITTLE LOVE" FROM 1958. MESH BAND WITH FAUX PEARL AND PUFFY ETCHED HEART PENDANT. 6 7/8" LONG, 3/16" WIDE. 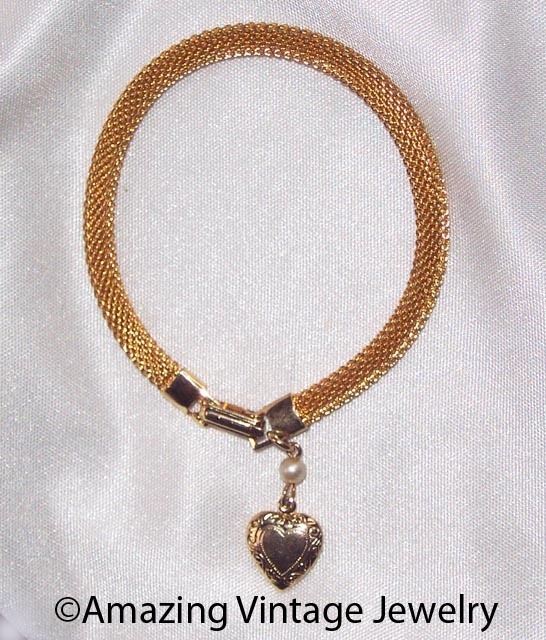 ORIGINALLY SOLD AS A CHILD'S BRACELET - EASILY WORN BY AN ADULT WITH A SMALL WRIST. VERY GOOD CONDITION.